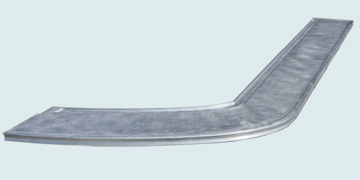 Handcrafted Metal makes exquisite L shaped zinc kitchen bars to suit your taste and accommodate your kitchen. With us you can customize every dimension and feature. You can also add detailing, such as fancy edges, backsplashes, hammering, and drainboards, to give your zinc countertop a powerful presence in your kitchen. Each custom zinc kitchen bar is fully welded and polished, and made with the purest zinc available. Feel free to choose how your L shaped zinc countertop kitchen bars will look, by combining our custom features into the perfect custom zinc kitchen bar for your kitchen. We will work with you to produce a work of art for your kitchen. To get started, click any of the L shaped kitchen bars below to see pricing and customize your dimensions and features. This zinc L top covers a separate prep area, and accommodates a small undermount sink. 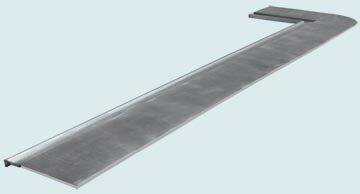 We made a virtually invisible weld at the corner to make it seamless, and shipped the top as a single piece. It's fully welded, and made from 16 gauge zinc with a natural hand-rubbed highlight finish. 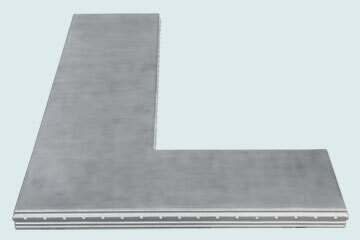 This single-piece L top has a fully welded integral zinc sink and a post cover at the right end. The backsplash has a 90° bend about half the diameter of a pencil, where it meets the deck. All welded 16 gauge zinc, natural hand rubbed highlight finish. Even though it's 17 feet long, this single-piece seamless top is the ultimate in minimalist simplicity. All exposed edges have our simple Normandie channel edge. The weld seam in the corner of the V is virtually undetectable. The front left is corner angled to keep it from jutting into a walkway. 16 Gauge all welded zinc, natural hand rubbed highlight finish with carnauba wax. This unusual T configuration required an unwelded seam at the junction of the two tops. Our Mont St. Michel edge on the fronts terminates at flat turn downs at the ends. The entire counter top is made from smooth zinc, is naturally-colored, and has a wax rub. Dentil detailing provides accent along the bottom edge of this bar top. Rounded corners add a graceful quality. Our tall 3"+ Chambord edge on the front adds a classic touch. The back edge is our 2" Mon Ami edge. All welded 16 gauge smooth zinc, natural hand rubbed highlight finish. Handcrafted Metal takes pride in our very high quality craftsmanship. We see your Zinc Kitchen Bars and Counters order as an opportunity to deliver our uncompromising design and craftsmanship. You can see that we offer a large number and an amazing variety of custom zinc kitchen bars designs. Our 25 years of experience in building zinc kitchen bars in every size, shape, and color gives us mastery of the essential methods, processes, and skills needed to produce a zinc kitchen counter or bar that exceeds your expectations. 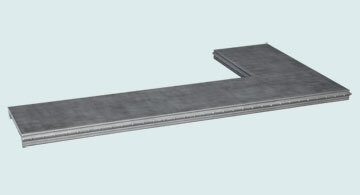 We have built thousands of Zinc Kitchen Bars and Counters. The vast array of styles, finishes, textures, and metals available for Handcrafted Metal Kitchen Bars and Counters provide almost unlimited choices. 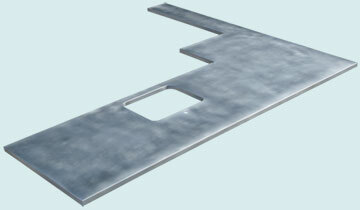 We offer an extensive selection of Zinc Bar Counter. 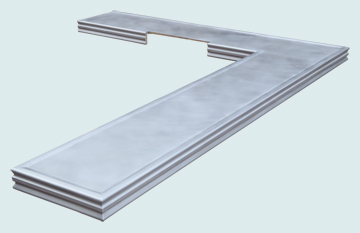 Just browse the Zinc Bar Counter Style to see our wide range of Zinc Bar Counter products. We are glad to answer any questions about any of our Zinc Bar Countertops. Call 1-800-755-0310 to speak with a product specialist who will help you select and configure your ideal zinc bar counter. Handcrafted Metal Bar Counter and Kitchen Bar are built in a way to be the focal point of your kitchen or Bar.